The purpose of this article is to serve as a general strategy guide with tips and advice that you should follow when attempting to win a team pizza challenge. There are many different partner pizza eating challenges all around the world, especially in the United States, and they come in all shapes and sizes. Most team pizza challenges allow for just two partners to finish a gigantic pizza with a diameter ranging between 26 inches and 36 inches. Those pizzas typically weigh between 9 pounds (4 kg) and 13 pounds (6 kg). The standard team pizza challenge is for a restaurant to have a 28″ or 30″ monster pizza for 2 people that weighs between 10 lbs (4.54 kg) and 12 lbs (5.45 kg). While that standard size is most popular, there are other team pizza challenges smaller or larger in diameter, depending on the thickness of the pizza and the number of people allowed on one team. For example, Beau Jo’s Grand Sicilian Pizza Challenge in Denver, Colorado is only 20″ between 2 people, but the pizza is extremely thick and weighs over 14 lbs (6.36 kg). Randy’s Premier 48″ Pizza Challenge is 48 inches in diameter, but NINE people are allowed on your team to finish the entire 32 lb pizza (14.55 kg). While most team pizza challenges are designed for just 2 people on 1 team, there are larger team challenges around the USA that allow teams of 3 to 10 people. Besides diameter, thickness, team size, and weight, the other two significantly varying factors are the toppings required on your pizza along with the time limit you are allowed to finish everything. Most team challenges have a time limit between 30 minutes and 1 hour, depending on the size and difficulty of the pizza along with the number of people allowed on the team. Some challenges require just one or two toppings, and some don’t have any extra topping requirements at all. Then there are some challenges that require you to finish a specialty pizza which features many different gourmet toppings. On some challenges, you get to choose your toppings, and then some challenges already have the toppings selected for you. Even though there are many different variations that you may encounter, the basic strategy you need to have remains the same for each and every team pizza challenge. Before we go into the specific strategy details for winning a team pizza challenge, please make sure you have read and understand our Basic Strategy For Winning A Food Challenge article. That article is full of 14 different basic strategy tips that will not be included in this article, which you also need to understand before attempting a team pizza challenge. Please start by watching our very informative How To Win A Team Pizza Challenge video so you can visually see all of our different tips put into practice during an actual partner pizza eating challenge. For this video, “Magic Mitch” Dombrowski and I attempted The 29″ Team Pizza Challenge at Schiappa’s Italian Restaurant in O’Fallon, Illinois. We had to finish a 10 lb (4.5 kg) 4-topping pizza within 30 minutes or less to get the pizza free along with other prizes. We got to choose all four toppings along with how we wanted it sliced. 1. Be sure your team has enough capacity to finish the entire pizza – Before you begin planning the precise strategy you will use for your team pizza challenge, you need to make sure your team will be fighting a battle that it can win. The first thing you need to do is find out the size and weight of the pizza you will be eating, if you don’t already know, since that will not vary or change. After analyzing the size of your opponent, you must then consider your individual capacities. Whether there are ten people on your team or just two, all your individual stomach capacities need to add up as a team to be nearly equal or greater than the total size of the challenge you want to attempt. Your individual capacities must be accurate too, and not inflated to sound better than you really are. It doesn’t matter what you ate last year or even yesterday, and it certainly doesn’t matter what you think you might be able to eat next year after a lot more training. How much will you each be able to eat on the day of your challenge? If those numbers don’t add up to a comfortable level, you need to either find a smaller team challenge or select a different partner (or partners) with a greater stomach capacity to team up with. 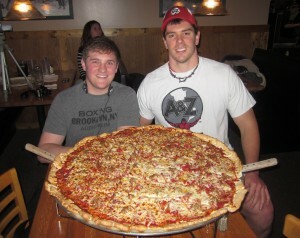 Two 2-star eaters that can only eat four pounds each should not think they can win a big ten pound pizza challenge together. Two wrongs don’t equal one right. One of the members needs to find a partner with a stomach capacity greater than 6 lbs, or you both need to find an 8 lb team challenge. Even if four 5-star eaters that can each eat 12 lbs by themselves team up together against a 50 lb team pizza challenge, they most likely won’t win because 48 does not equal 50. When selecting a partner to team up with for a 2-person team pizza challenge, remember that whatever he or she cannot eat, you will have to eat yourself. Whether you leave 1 piece or 10 pieces, or even 10 lbs of pizza, a loss is a loss and large pizzas typically aren’t cheap, so please choose your partner(s) wisely. 2. Pick smart pizza toppings if you are allowed to choose them – If the restaurant’s “house rules” require that you must eat pepperoni and sausage on your pizza or that you must eat a particular specialty pizza on their menu such as “meat lovers”, this doesn’t really apply to you since you don’t have the option of choosing what toppings you want. You just have to adjust and conquer the pizza with the toppings you have been given. If you are given the option though, be sure to choose toppings that you enjoy, and more importantly you need to choose toppings that you can eat a lot of. There are some pizza challenges that require 2 meat toppings or 4 veggie toppings. In cases like this, the option is up to you and your taste preferences because each choice will be about equally as difficult. The 4 lighter veggies will match up with the 2 heavier meats. It just depends on what you would enjoy more. On our pizza in the video, we could choose whatever 4 toppings we wanted, so we picked one meat for flavoring to go along with green peppers, black olives, and onions. Mushrooms are a good veggie topping too if you enjoy those. For meats, you want to completely avoid all really salty toppings such as bacon. Hamburger can go both ways, depending on the restaurant that serves it. You may love bacon, but you won’t by the time your challenge is finished. The salty taste will cause you to drink more liquids throughout the challenge and flavor fatigue hits you harder with salty foods. You also want to avoid really fatty and greasy meats when possible. You don’t want your pizza dripping with grease. The best and easiest meats to choose are the lean and flat ones, particularly ham and Canadian bacon when they are available. Most restaurants don’t offer turkey, chicken, and meats like that, but they are better choices than bacon and sausage. Pepperoni can be a good choice too, even though it is fatty, especially if the restaurant does not load the pizza up with toppings. If your pizza will be covered entirely with pepperoni though if you do select it, you may want to avoid it. Two pounds of greasy pizza may be delicious, but five pounds will not be, especially the last two if they are cold. 3. If possible, choose different toppings for each side of the pizza – If you are allowed to choose the topping(s) you want on your pizza, the restaurant will also most likely let you switch up the toppings, and use different options on each half, or even each quarter. Your taste buds will be a lot happier if you do this because you will get to experience different flavors during different parts of the challenge. If you only need to have 1 topping, choose your favorite option for your side and then have your partner choose a delicious topping for his or her side. It would be very helpful for the team though if you both enjoy both toppings because you will be eating the pizza as a team, and not individuals. If you can split the pizza up into fourths, feel free to do that too. Add a light vegetable topping to three of the four quarters and then ham or Canadian bacon to the fourth quarter just to have a meaty flavor. If allowed, to help you towards the end of the challenge, switch up your toppings as much as possible so you don’t have to use extra sauces & drinks which just take up precious space in your stomach. 4. Slice your pizza into small squares rather than huge slices – You are typically allowed to choose whether you want your giant pizza cut into a few massive slices or many smaller squares. The choice is completely up to you, but there is much more of a “team feeling” associated with having many smaller squares. As mentioned below, the best strategy is to work as a team to finish off the middle slices first with all the warm meats and cheeses. This is much easier to do if you both can just keep grabbing pieces from the middle, like Mitch and I did in the video above. If you just have 8 giant slices, they will be harder to handle and eat, and there will be more focus on each of you as individuals rather than you both working together as a team. You will each know exactly how much the other person has eaten and will be trying to keep up with each other. In the end, percentages don’t really matter at all. It just matters that your team wins!! There are two other benefits to cutting your pizza into squares too. The first benefit is that your mind will be able to see progress a lot faster by eating many smaller squares, which will keep you motivated and feeling strong for a longer period of time. Finishing 10 small squares in 5 minutes feels and sounds a lot better than finishing 1 massive slice during that same period, even though they both equal the same total amount. The second benefit is that grease drains a lot easier when there are many squares and openings in the pizza. If the cheese and toppings are greasy, you may experience puddles of grease on your pizza when it arrives at your table if you selected large slices. You may even have some on your smaller squares too. If there is a lot of grease, ask the owner or manager if you can use napkins to soak up some of the grease. Some restaurants will let you and some will not, but you definitely won’t know if you don’t ask. 5. Eat together as a team rather than separate individuals – Whether you and your partner(s) are equally matched or one of you is a lot better than the other(s), you are a team and you need to eat like you are a team. Work together to get the victory, rather than having the mentality “you eat your half and I will eat mine.” You don’t need to train beforehand together or anything crazy like that, but think as a team, strategize as a team, and you will win as a team. Even if you eat 75% and your partner only eats 25%, your picture together goes up on the Wall Of Fame together. You still needed your teammate for that last fourth!! If he or she was not there on your team, you would have lost the challenge. Support your teammate & motivate him or her to keep eating!! 6. Eat the middle portion with all the cheese & toppings first – The key to winning a large pizza challenge is eating as much of the middle section as you can before the cheese, meats, and toppings all cool down, harden, and become much tougher to chew and swallow. Save the exterior crust pieces for last. During steak and burger challenges, you want to eat the meats first before they get cold, dry, and tougher to enjoy than when the meal first got to your table. You also want to eat the meat first because it makes up a majority of the weight of your challenge. Finish the largest, heaviest part first while it is warm and juicy, and then coast to victory. The same theory works for pizza challenges. Eat the entire middle section before focusing on the chewy crust. With most gigantic pizzas, the inside portion makes up 90% of the challenge, so get it all down while it is warm, greasy, and delicious. Once it gets cold, you will need to use sauces and liquids to help consume it, which just take up additional space in your stomach. It is easier to eat the middle and follow proper strategy if you cut it into squares. If you do pick large slices though, just eat each slice down to the crust and move on to the next one. 7. Eat the exterior crust pieces last after the middle is gone – During food challenges, you typically want to eat the meats and proteins first and then the high carbohydrate items such as french fries, buns, and pizza crusts, just like we explained above. The difference between warm and greasy cheese and cooled down and dry cheese is significantly greater than the difference between warm pizza crust and cooled down pizza crust. Eating crust will be much easier on your taste buds too at the end of the challenge because cooled down crust tastes better than cooled down pizza sauce. To help with the flavor, feel free to dip a few crust pieces in marinara (red sauce) or a dressing such as ranch. Sometimes I use hot sauce!! You may also want to sip on soda (diet or regular) while eating the crust too. The acidity will help break down the crust in your mouth while you chew it, and the intense taste will overpower the taste of the bland crust. The carbonation will also help burp up any remaining air in your stomach to make room for the final pieces. If the crust is extremely chewy and you feel the need to dunk it in liquid to help soften each bite so that it is easier to swallow, you can do that if the restaurant allows you to, but try dunking in sauce first because it is much more mannerly. Dunking crust pieces into liquid is very disgusting. 8. Analyze your individual strengths, weaknesses, and preferences – You and your partner(s) may have similar eating speed and maybe even similar stomach capacities, but no two people are the exact same. Every eater is unique with his or her own individual strengths, weaknesses, and preferences. As a team, you need to analyze the individuals on the team so that you can include them into your team challenge strategy. Is one of you more about stomach capacity but not much of a speed eater, while the other person can eat faster but cannot eat as much? What toppings do you like and what toppings does your partner(s) like? Do you like pizza crust more than all of the heavy cheese while your partner enjoys the middle toppings rather than the crust? Consider all of your differences and include them in your team’s strategy so that the team working together has no weaknesses!! 9. Be sure to have enough jaw endurance to finish the chewy crust – Almost all pizzerias and restaurants use a different pizza crust with unique flavors and ingredients, but most extremely large monster pizzas use a “New York style” hand-tossed crust that is pretty chewy. How easily the middle crust below all the toppings will go down mostly depends on how much pizza sauce and cheese is added, along with how the pizza is cooked. The chewiness of the exterior crust really just depends on how much crust the restaurant leaves on their pizzas. You will find that some giant pizzas have thin crusts, and you may also find crusts that are very thick. Either way, your jaw and mouth will have to work overtime to chew and swallow the entire pizza before your time limit expires. You can use some liquids and sauces to help soften the crusts, but there will still be a lot of chewing involved. You need to make sure that your jaw is prepared, and that your partner’s jaw is too. For more tips to help you all train to increase your jaw strength and endurance, read How To Increase Your Jaw Strength under our Tips category. Your stomach capacity doesn’t matter if your jaw can’t chew it all so it can be swallowed. 10. Towards the end, divide the remaining pieces up individually – When you and your partner(s) get down to the last few bits & pieces of the challenge, which should be crust pieces, feel free to divide up the remaining pieces between you all so that each person knows what he or she personally has to finish. If you or a partner has bitten into a particular piece, obviously that person has claimed that piece. Do your best not to exchange saliva and bacteria unnecessarily. Also to minimize this, keep one remaining small piece and place it in the middle so that whoever finishes first can then finish up the last piece. It is senseless to have one person sitting there waiting a long time for everyone else to finish. It is a team challenge, so it is perfectly fine if the strongest eater has a little more than everyone else. Once you have your last few pieces in front of you and you know that you will finish it, push forward and get the team victory. Don’t hold back just to avoid eating that last middle piece!! 11. Start and finish together as a team without any members quitting – It is a team effort, but each individual is going to have different eating speed and stomach capacity than the other members of the team. The main thing to help guarantee success is that nobody should completely quit and throw in the towel. If you are the weakest link on your team and you become full before your teammates, do not quit!! Continue eating, but at a slower pace. Eating very slowly and acting like you are really trying hard and wanting the victory will help keep your stronger partner(s) motivated to keep eating and finish the rest so that you don’t have to. If you quit & act like you don’t care, it will be very disheartening for your teammate(s) still eating. If you are the stronger eater on your team, make sure the other person doesn’t have a quitter’s mentality. If he or she does have a “quitting attitude”, you may want to find a new partner. You start as a team and you finish as a team. Don’t let anyone quit along the way, but don’t force anyone to eat until they get sick and puke, causing you to be disqualified. 12. If one person starts feeling sick, it’s okay to take a short break – While you should definitely start together and end together as a united team, you may encounter situations where one of the members of your team is beginning to feel sick from eating too much too quickly. At this point, he or she needs to follow our tips in What To Do If You Begin Feeling Sick. If that person pushes too hard and throws up, your team will be disqualified and you will lose. Even if you can still continue eating, if your partner throws up, you as a team will be disqualified. Make sure everyone on the team knows that they need to make sure not to go overboard while trying to keep up with everyone else’s eating pace. If one person has to eat more than the rest to get the victory, that is okay. It is senseless for one person to get sick and throw up while the other teammate(s) is still feeling great and eating strong. Have that person take a short break while everyone else continues to eat. When ready, start eating small bites and let everyone else finish the rest. If you and your partner are both really full and there is still a lot left, know when to say when. If you know there is no chance of finishing, save the rest for leftovers and come back another day after you have trained more or when you have found a stronger eating partner to compete with. Team pizza challenges, and pizza challenges in general, are a shining example of how important your stomach capacity is when attempting food challenges. If your team’s stomach capacity is much higher than the size of the pizza you are attempting, your eating strategy is not nearly as important. It won’t be a huge deal whether you get it cut into squares or slices, or whether you eat the crust along with the slices. If you know you will win and the challenge only requires one or two toppings, you may even want to order a specialty pizza just so that you can enjoy the taste more and get the typically more expensive pizza for free because you won. Have fun with it!! For Mitch and I, our team capacity was over twelve pounds and we attempted a ten pound team challenge. We could have definitely gotten a specialty pizza or whatever else we wanted. For more tips on increasing and training your stomach capacity, check out our Stomach Capacity Training section. Remember also that the tips above apply to all team pizza challenges, whether you and a friend are attempting a 28″ ten pound pizza or you and ten friends are attempting a fifty pound pizza. These eating strategies all still apply and they will work!! If you combine the tips above with the Basic Strategy Tips For Winning A Food Challenge, and also our How To Win A Pizza Eating Challenge article for individuals wanting to win solo pizza challenges, you have all the major advice that you need to plan the strategy you will use to dominate your next team pizza challenge. You may also want to check out our How To Win A Team Food Challenge article that better explains how to strategize for other team challenges that involve foods other than pizza. That too will include a few additional tips not listed above.